The annual Rattler at South Alabama Speedway in Opp, Alabama is one of those legendary preseason “big ones” The Rattler has been run every year since 1974 and some of the biggest and best Short Track racers from around the Southeast (and around the country) have won the event. Names like Pete Hamilton, Dave Mader III, Mickey Gibbs, Ronnie Sanders, Wayne Neidecken Jr., Charlie Bradberry and Wayne Willard have all captured the prestigious event. 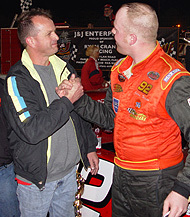 So it was one of the races that rising star Jason Hogan always had circled in his mind as one of the biggest and best Super Late Model shows that he’d like to win in his racing career. 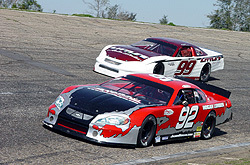 In fact, he said it ranked just behind the Snowball Derby and the All American 400. It wasn’t easy for Hogan by any means. And Hogan may have not had the best car during the night. But he was able to keep his car out of trouble (something very few other guys were able to do) and also use a little bit of racing luck and good fortunes to win and stay out of the 21 cautions that waved over the field on Saturday night. Early in the race, it looked like Hogan nor anyone would have anything for surprising polesitter Scot Smith. 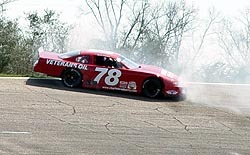 Smith jumped out to the lead from the pole and proceeded to hold off the field of challengers, including strong runs at him by Hogan, Junior Niedecken and Ronnie Sanders, to lead the race’s first 131 laps. However, on lap 132, Sanders finally got the better of Smith, but not in the good way. Sanders, after falling a lap down, was working on Smith to get his lap back when the two made contact. That contact sent Smith spinning into the inside wall and out of the lead and out of the race. A dejected Smith had a few gestures for Sanders on the track following the accident, but took the wreck in stride after the event. 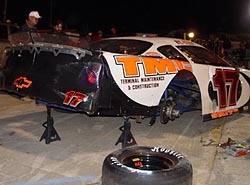 Scot Smith may have had the best car on Saturday night, but it ended up on jack stands in the pits. blame for not letting him go. You just got to stay clear of Ronnie because he’ll drive over you and not think twice about it. That handed the lead over to Hogan for the first time, even though it was for just one lap, as the entire field came to pit road for their second stop of the night. Hogan was fourth out of the pits behind Eddie Mercer, Charlie Bradberry and Jeremy Rice. Hogan made quick work of Rice, while Mercer and Bradberry made quick work of new leader Keith Cahela, who stayed out during the round of stops. Mercer, Bradberry and Hogan led the field for 10 laps before Hogan fell into first place yet again, this time as Mercer and Bradberry got into it while battling for the lead. Bradberry neglected to stay in his pits and took off back to the track before track officials brought him back in. However, the officials found nothing, but took measures to tape some wires together, and, after some discussion, sent Bradberry to the tail of the field for the restart. The Bradberry-Mercer incident put Hogan again once in the lead with just 50 laps to go. So with Donald Long breathing down on his neck and six restarts in the last 50 circuits, Hogan had a challenge in front of him to keep his #92 out front. He was up for the challenge. Charlie Bradberry's day started bad with a spin in practice and just got worse as the night went on. “The last time we were here, for a 100-lap race, the car was terrible. I was embarrassed to actually get out of the car. But we knew we had a good car here and we knew it after practice. We came in after about an hour of practice and decided to park the car to save it up. About a half hour before practice ended, my crew chief (his uncle Jimmy Hogan) came to me and said we’ve had two more shocks in the trailer that we hadn’t tried because he forgot about them. So we went out and tried them, put the old ones back on the car and put the new ones back on and we left them on there to race and it was key. “It was a big help to the car. That, along with our good pit strategy helped us win this race. We decided to take two (tires) to begin with and four on our last pit stop and we thought that might be and iffy call. We were just as fast on two tires as on four, and lot of that says a lot about the crew. Jason is congratulated in Victory Lane by crew chief and uncle Jimmy. Well, after Saturday night, Hogan can cross the Rattler off his list of “hopefuls” and add the Rattler trophy to his mantle. 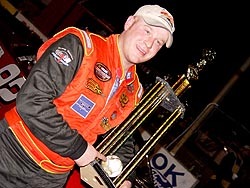 The 22-year-old led the last 50 laps in Saturday night’s 200-lap event to take home the $10,000 first prize and the bragging rights that go along with one of the South’s biggest open Super Late Model shows. momentum. We ended last year strong. We’ve gotta get a good consistent year, instead of half and half like we normally do. If we do that, I think we can be unstoppable. Hogan (#92) on the inside of Dale Little (#99). It was another good start of the year for Hogan, who professes that he has a problem for starting and ending seasons hot, but slacks off in the middle, as he did in 2004 when he won two of the first three Southeast Series races before falling on tough luck midway through the year.